Rod Barajas, that’s not a name that I’ve heard in years. Minor league coaches getting more and more opportunities as clubs get away from the retreds as the should. Rod Barajas- He hit his first career home run in the last game of the season on October 3, 1999, against the San Diego Padres, a line-drive to left-center field off of Heath Murray. why did someone downvote this? Is it Heath Murray? Actually, I just looked up Barajas on wikipedia, and that little home run anecdote is quoted verbatim on wikipedia. So, yeah, it is unlikely that the original poster was citing first hand knowledge. If he is just quoting wikipedia, yeah, that is kind of lame. what if he wrote the wiki? Why is that lame? Nice stat, who cares how RATTY found it? Yeah these guys go through hitting coaches like pairs of socks. Maybe this guy will be able to connect better with the players than Stairs did last year. It’s pretty pathetic that they’ve finished dead last in the majors in team OBP for the past five years now. 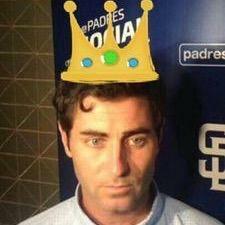 the Padres are perennial losers…nothing they do will help them, period..been following them since the 60’s and they haven’t figured it out yet..